Colorado has a dire need for urban wood utilization — a need that was amplified when emerald ash borer was discovered in Boulder in 2013. If you are interested in helping our local environment and our economy as well as your pocketbook by getting valuable urban wood to the reutilization market instead of sending it to a landfill, watch the video above and check out the information below. It should help get you started. What kinds of trees are valuable for milling? Typically, you’re looking for sound wood from trees 1 to 3 feet in diameter and 6 to 16 feet long. But many woodworking operations, such as Wood in 2 Wood featured in the video above, can work with even smaller trees. How much is urban wood worth? Urban logs are worth 10% of final finished lumber price. And it’s important to note that urban wood is worth more than lumber from other non-local or mass-harvested sources. Each 20 board feet section of dry hardwood is worth approximately $3. Will the mill owner pay for the logs? Species by species, a mill owner will pay $.30 to $1.50 per board foot of lumber, if you bring it to his or her yard. Do I have to do anything special with the logs when removing them or storing them? As long as you remove and move them safely, keep the logs as large as you can. Within 1-2 days, paint the ends of the wood with anything you have – preferable anchor sealant, if available. Will mill owners come and get the logs or mill them at my site? Should be I declare the logs ready to be picked up or milled on site? Yes. In fact, the industry could use more portable mills. Portable mill operators can typically charge $80 to $120 an hour depending on capability and experience. How much does a portable mill like the one in the video cost? The mills can range from $2,000 to $20,000, depending on type and quality. What tree care companies and/or arborists are already re-utilizing urban logs? There are many, but a few include Helping Hand, 303 Tree, A Cut Above, Taddiken, Lovett Tree Company and Rich Wooley Tree. Purdue University, 2014- Describes key differences between wood products from traditional forests and those available from urban forests. US Forest Service Wood Education and Resource Center, 2012- Information for resource managers on the properties, processing characteristics and potential products that can be manufactured from hardwoods that have been attacked by various invasive species. Delta Institute- Important considerations for resource managers and homeowners interested in urban wood utilization, including helpful checklists. Dovetail Partners, 2014- Brief highlights of opportunities and success stories in urban wood utilization. Purdue University Forestry and Natural Resources, 2002- Basic considerations for those interested in utilizing urban trees. Edith Makra, Illinois EAB Wood Utilization Team, 2015- General information about urban wood utilization, potential markets and the need to create a comprehensive supply chain network. Southeast Michigan Resource Conservation and Development Council- A great list of resources, note not that the page is a tad old, so some links are unavailable. Southeast Michigan Resource Conservation and Development Council- Excellent guide for creating a comprehensive urban wood utilization plan in your community. US Forest Service, Northeastern Area, Southeast Michigan RC&D Council, Michigan DNR, 2007- Components of and strategies for developing a successful urban wood utilization plan. Colorado Department of Agriculture, 2013- General information about creating a management plan for invasive species, including guidelines for creating an urban wood utilization component. US Forest Service, 2001- Highlights 16 successful urban wood utilization projects from across the country. Illinois Wood Utilization Team, 2011- Very helpful economic viability study regarding the development of a community wood reclamation center. A good template for any city or cluster considering such an undertaking. US Forest Service Urban Forest Connections webinar, 2015- Case studies detailing successful wood utilization efforts in Raleigh, NC, Richmond, VA, and Cincinnati, OH. Illinois Institute of Technology Undergraduate Interprofessional Project, 2009- Explores potential opportunities and markets for EAB- and DED-killed trees in the greater Chicago area with three case studies. A good template for cities exploring the feasibility of and opportunities for urban wood utilization. US Forest Service, 2002- Eight case studies of successful urban wood waste recycling projects and businesses. Terry Gonder, Cherry Creek Designs LLC, 720-382-3591- The main goal of Cherry Creek Designs LLC is to collect wood that is normally placed in a land fills or used for firewood and turn them into goods. 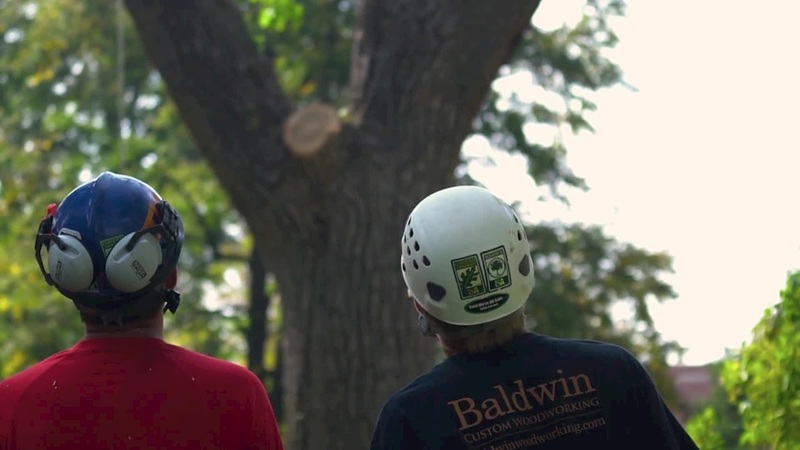 Matthew Mayo, Preservation Tree Care, 303-870-1634-Preservation Tree Care works with a number of mills to turn the wood into lumber either as specified by the mill or by the owner. The materials can then be used for a multitude of things.